Bozeman is a city in and the county seat of Gallatin County, Montana, United States, in the southwestern part of the state. Change things up with these side-trips from Bozeman: Big Sky (River Rafting & Tubing, Big Sky Chapel, & more) and Fishing Charters & Tours (in Livingston). The adventure continues: get a new perspective on nature at Museum of the Rockies, appreciate the extensive heritage of Downtown Bozeman, see the interesting displays at American Computer Museum, and meet the residents at Montana Grizzly Encounter. To find reviews, maps, other places to visit, and tourist information, refer to the Bozeman trip planner . Milan, Italy to Bozeman is an approximately 19-hour flight. You'll gain 8 hours traveling from Milan to Bozeman due to the time zone difference. Expect slightly colder temperatures when traveling from Milan in June; daily highs in Bozeman reach 29°C and lows reach 8°C. Finish up your sightseeing early on the 19th (Wed) so you can go by car to Gardiner. On the 20th (Thu), relax and float downstream with a rafting and tubing tour, then take a pleasant ride with a tour on horseback, and then stop by Yellowstone Gifts & Sweets. On the next day, contemplate the waterfront views at Dailey Lake and then ride a horse along Wilderness Connection. To see traveler tips, more things to do, other places to visit, and other tourist information, you can read our Gardiner visit website . Traveling by car from Bozeman to Gardiner takes 1.5 hours. Alternatively, you can take a bus. Traveling from Bozeman in June, expect Gardiner to be slightly colder, temps between 24°C and 1°C. Wrap up your sightseeing on the 21st (Fri) to allow time to travel to Cooke City. Cooke City-Silver Gate is a census-designated place (CDP) in Park County, Montana, United States. 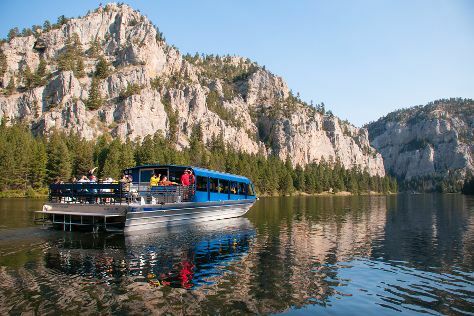 On the 22nd (Sat), get a new perspective on nature at Yellowstone Trading Post, take a memorable drive along Beartooth Hwy, and then cruise along Beartooth Highway. On the 23rd (Sun), you'll have a packed day of sightseeing: look for gifts at Sylvia's Sweet Shoppe, then get engrossed in the history at Cooke City Montana Museum, then take in panoramic vistas at Clay Butte Fire Lookout Tower, and finally trek along Clarks Fork Trail. For ratings, more things to do, and tourist information, read our Cooke City trip planner. Traveling by car from Gardiner to Cooke City takes 2 hours. In June, daytime highs in Cooke City are 22°C, while nighttime lows are 1°C. Wrap up your sightseeing on the 23rd (Sun) to allow time to travel to West Yellowstone. West Yellowstone is known for wildlife, nature, nightlife, adventure, and theme parks. Your plan includes some of its best attractions: identify plant and animal life at Grizzly and Wolf Discovery Center, have some family-friendly fun at Madison Avenue Old Time Photos, trot along with a tour on horseback, and contemplate the waterfront views at Yellowstone River. To find where to stay, photos, maps, and tourist information, read West Yellowstone trip planning website . You can drive from Cooke City to West Yellowstone in 5 hours. In June, daytime highs in West Yellowstone are 24°C, while nighttime lows are 1°C. Finish your sightseeing early on the 27th (Thu) to allow enough time to drive to Great Falls. Great Falls is a city in and the county seat of Cascade County, Montana, United States. Great Falls is known for historic sites, museums, nature, trails, and parks. Your plan includes some of its best attractions: get to know the fascinating history of Lewis and Clark Interpretive Center, take in the architecture and atmosphere at St. Ann Cathedral, admire the majestic nature at Giant Springs State Park, and tee off at Valley View Garden Golf. For other places to visit, reviews, more things to do, and other tourist information, go to the Great Falls trip itinerary planner . Getting from West Yellowstone to Great Falls by car takes about 5 hours. Other options: fly; or do a combination of flight and shuttle. Traveling from West Yellowstone in June, expect Great Falls to be a bit warmer, temps between 28°C and 9°C. Cap off your sightseeing on the 1st (Mon) early enough to go by car to Helena. Helena is the capital city of the U.S. Venture out of the city with trips to Deer Lodge (Grant-Kohrs Ranch, Powell County Museum & Arts Foundation, & more) and Butte (Our Lady of the Rockies, Copper Canyon Harley Davidson, & more). Next up on the itinerary: explore the striking landscape of Gates of the Mountains, get engrossed in the history at Montana Historical Society Museum, get a taste of the local shopping with Archie Bray Foundation, and take in nature's colorful creations at Tizer Botanical Gardens & Arboretum. For maps, where to stay, photos, and more tourist information, refer to the Helena online trip itinerary builder . You can drive from Great Falls to Helena in 2 hours. Alternatively, you can take a shuttle. In July, daily temperatures in Helena can reach 37°C, while at night they dip to 16°C. Wrap up your sightseeing on the 6th (Sat) early enough to drive to Missoula. Missoula is a city in the U.S. Venture out of the city with trips to Rugg's Outfitting (in Superior), Seeley Lake Nordic Trails (in Seeley Lake) and River Rafting & Tubing (in Alberton). Next up on the itinerary: get in on the family fun at A Carousel for Missoula, take your sightseeing to a higher altitude at Mount Jumbo North Peak Trail, stroll through Caras Park, and immerse yourself in nature at Travelers' Rest State Park. To find where to stay, reviews, other places to visit, and other tourist information, read Missoula trip itinerary planning app . You can drive from Helena to Missoula in 2 hours. Another option is to do a combination of shuttle and bus. In July, daily temperatures in Missoula can reach 36°C, while at night they dip to 13°C. Finish your sightseeing early on the 11th (Thu) to allow enough time to travel to Polson. Polson is a city in Lake County, Montana, United States, on the southern shore of Flathead Lake. Venture out of the city with trips to National Bison Range (in Moiese) and Bigfork (Wild Trout Adventures & Flathead Lake Charters). There's lots more to do: contemplate the waterfront views at Flathead Lake, see human ingenuity at work at Kerr Dam, examine the collection at Miracle of America Museum (MoAM), and play a few rounds at Polson Country Club. To see maps, reviews, traveler tips, and other tourist information, read Polson attractions planner . Drive from Missoula to Polson in 1.5 hours. In July in Polson, expect temperatures between 34°C during the day and 11°C at night. Wrap up your sightseeing on the 14th (Sun) to allow time to travel to Whitefish. Whitefish is a city in Flathead County, Montana, United States. Venture out of the city with trips to West Glacier (River Rafting & Tubing & Hidden Lake) and Bigfork (Wayfarers State Park & Eva Gates Homemade Preserves). Spend the 19th (Fri) exploring nature at Glacier National Park. There's still lots to do: stroll through Whitefish Mountain Resort, hike along The Whitefish Trail, sample the fine beverages at Glacier Distilling Company, and explore the galleries of Conrad Mansion. To see photos, reviews, traveler tips, and other tourist information, use the Whitefish travel planner. Getting from Polson to Whitefish by car takes about 1.5 hours. In July in Whitefish, expect temperatures between 34°C during the day and 11°C at night. Wrap up your sightseeing on the 19th (Fri) to allow time to drive to Glacier National Park. Spend the 21st (Sun) exploring nature at Waterton-Glacier International Peace Park. And it doesn't end there: cruise along Going-to-the-Sun Road, tour the pleasant surroundings at Iceberg Lake Trail, trek along Highline Trail, and contemplate the waterfront views at Lake McDonald. Quickly create a custom-made itinerary for Glacier National Park using our trip planner. Traveling by car from Whitefish to Glacier National Park takes 1.5 hours. Alternatively, you can do a combination of train and taxi. In July in Glacier National Park, expect temperatures between 34°C during the day and 11°C at night. Finish up your sightseeing early on the 25th (Thu) so you can travel to Billings. Billings is the largest city in the state of Montana, and is the principal city of the Billings Metropolitan Area with a population of 166,855.Billings is located in the south-eastern portion of the state and is the seat of Yellowstone County, which had a 2015 population of 157,048. Get out of town with these interesting Billings side-trips: Pompeys Pillar National Monument (in Pompeys Pillar) and Crow Agency (Little Bighorn Battlefield & Custer Battlefield Trading Post & Cafe). And it doesn't end there: take a pleasant ride with a tour on horseback, head outdoors with Outlaw Canyon Adventures, LLC, explore and take pictures at Dehler Park, and explore the engaging exhibits at Wise Wonders Children's Museum. To see traveler tips, reviews, and other tourist information, go to the Billings travel planner . You can do a combination of taxi and flight from Glacier National Park to Billings in 5.5 hours. Alternatively, you can drive. Expect a bit warmer evenings in Billings when traveling from Glacier National Park in July, with lows around 18°C. On the 30th (Tue), wrap the sightseeing up by early afternoon so you can travel back home.